resort should be ready for guests again by next week. the brunt of the hurricane. I have tried to answer all your email but I am inundated with hundreds and it will take days . So please read this message and only contact me if you have an urgent situation. Some damage was sustained by Sonesta but they continue to operate and the guests tell me that the general manager was out in the storm personally delivering food and beverage to his guests. Message from Eudoxy And Sandra at Scilly Key Hello to all our friends we are Fine and we will be open on Wednesday and on Sundays untill you all come back. Anguilla will have a tourist season this year and most of the beautiful beaches will be even more dazzling. I thank you all for your Concern its nice to Know that we have such a loyal following , so to all you Anguillaphiles I say Cheers and drop by for a drink on your next visit.. I just received an email from Una Gumbs representing Rendevous Bay and the email states that Rendevous Bay is open and has sustained NO STRUCTURAL DAMAGE. I again urge all to continue trying to make contact direct with the various properties of interest. I will continue my postings as accurately as possible. I have requested information from the tourist department in reference to all of the properties but they have not responded due to communication problems. Stay tuned. I just received a LIVE radio report on Anguilla. All of the major hotels have been badly damaged and the beaches as well. 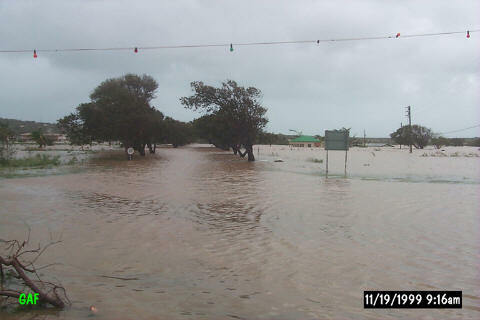 Malliouhana apparently feared the best with only minor structural damage and the stand by generator under water. They should be up and ready for the tourist season. Rendevous Bay, Anguilla Great House, Cuisinart and Cap Juluca have sustained structural and water damages that are very severe. Ashley's supermarket was totally flooded (10 to 11 feet of water) and therefore they have sustained millions of $ in damages to building, items, Air Conditioning ...the business. At East End, the pond rose and there are homes there that are covered completely by water. Some family names of these homes were mentioned in the report. They were using boats to evaucate. The Valley experienced the same major flooding and boats were also used. The Bottom flooded and Sandy Ground pond burst and flowed into the sea contaminating the water there and many fishing boats were lost as a result of the pressure. There are poles, electrical wires down so Cable TV and Electricity is out. Telephones are working in some areas. The British Navy is on Anguilla and are currently doing an aerial survey of the island. 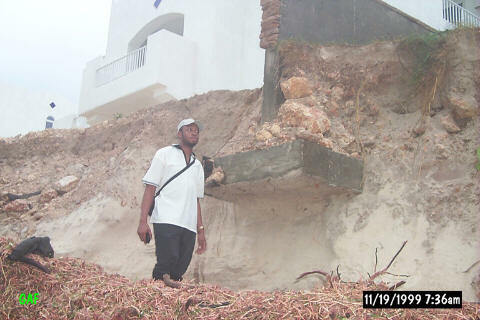 Because most of the homes on Anguilla have concrete roofs, there was minimal damage to roofs on the island. I have received lots of inquiries on Kellyvilla at Seafeathers, so to the general public, my sources tell me that it is intact...only the spouting was lost and flooding like everywhere. It therefore has received no damage. Anguillians are a resilient people and they have already vowed to pick up the pieces and start again. They will rise again with friends like you all praying for them and supporting their efforts. Again, there were no lives lost in on Anguilla. better, you'd think it was just an overcast day in Anguilla. work on getting things up and running again. fingers they'll be back by Thanksgiving! Its 7.40am Friday and for some reason unknown to me we are still on the air. Lenny has passed its still raining with squally winds. I left my house at 5.45 to check on my airplane it took me almost two hours to get to Crocus bay via the airport,The valley is unpassable Ashley's store is in ten feet of water,the flood water goes all the way from Eric Rieds house at north side to the cricket ground . At the airport two aircraft were destroyed both of them Islanders, one belonging two viecas airlink and one local, I was lucky to own an Hanger and both the planes in it were untouched. I was lucky again when I got to Roys Place I found that the structure was sound. I have decided to open tonight on a limited happy hour basis, people will need a place to meet and hot safe food. I am posting this from Crocus Bay , i am able to do this because after the damage caused by Hurricane Luis in 1995 we invested in generators for the house and the business. For those of you who are guests in my apartments they are fine and the beach is better than ever although a lot of the shrubbery is gone and the trees have lost branches . I will give detailed reports as I get information on the rest of the Island . Based on the flooding in the valley I would say that all low lying areas are flooded, this would include east end,Island harbor,sandy ground,west end and blowing point. as far as I am aware there were no injuries on Anguilla. I am getting direct reports from Anguilla because the telephone services still works on most of the island. Residents in the Sandy Ground area are calling for evacuation. The waters and rain are causing major damage in this area. The East End area (the corn) close to the clinic is completely flooding. Residents are taking boats to get to their families and evacuate them from that area. The Cuisinart Resort was badly damaged due to storm surges. It is reported that one or two of the buildings shifted due to the fact that it was built on or very close to the sand. 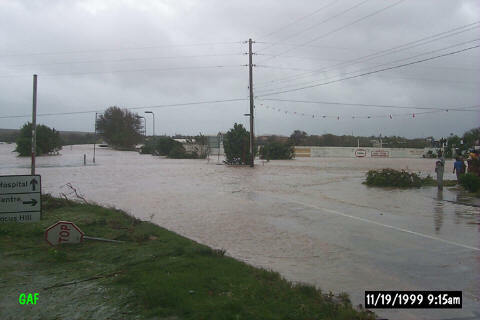 With this storm create significant storm surges, they couldn't help but have the end result. 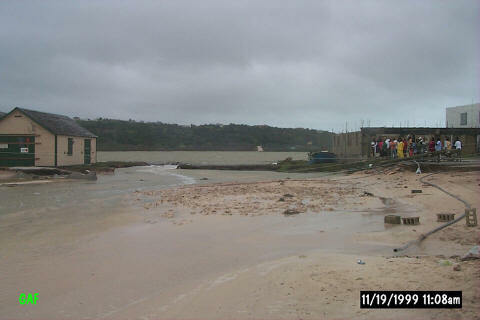 The Rendevous Bay is also very damaged. 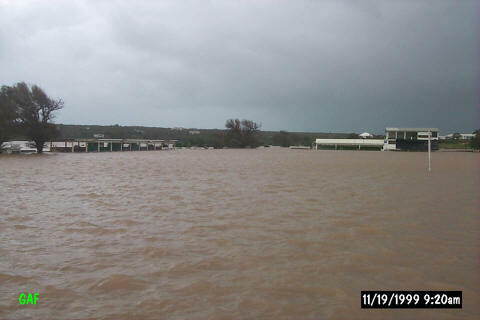 Cap Juluca is totally flooded and all of the beaches mentioned above have been destroyed. It will take some time to restore these beautiful beaches. I have not had any reports of structural damage as yet because my sources are unable to make a complete island tour. They are now in the eye wall and it is relatively calm. The residents are out and about at this time trying to secure other relatives that need to be evacuated. This is being done mainly by boat. 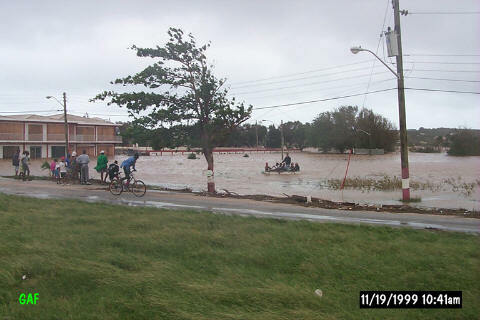 Anguilla's reports of St. Martin is terrible. They are reporting structural and cosmetic problems in St. Martin. No word on St. Barths as yet. Will post as I am contacted from Anguilla. wireless many phone lines are still open. slowly moves eastward throughout the night. unfortunately a lot of the news is bad news. we  will see a reduction in the next few hours. Flash the govt admin office in St Maarten has just lost its roof. Anguilla and got an update on conditions there. matches are soaked, so they have no light. It sounds pretty gloomy. When he called, he sounded like he was on a bad cel phone connection. expect the full force in the next hour or two. western side of the island. still working ok 1 264 235 6248 land line is 1264 497 5242. Once again thanks for your concern. Email subscribe to join the list. Crocus bay are ok for the time being. will be able to maintain these postings as long as the phone lines hold. This may be my last chance at contact, its 5.30 PM Wednesday Nov 17th conditions are very bad, torrential downpour, winds are tropical storm force gusting to hurricane force and increasing rapidly,darkness came an hour and a half early.The sea continues to rise , we expect it to get much worse before it gets better.I am switching off now,I will try to post again at 6am . It is 10.15 am Wednesday Nov 17th. 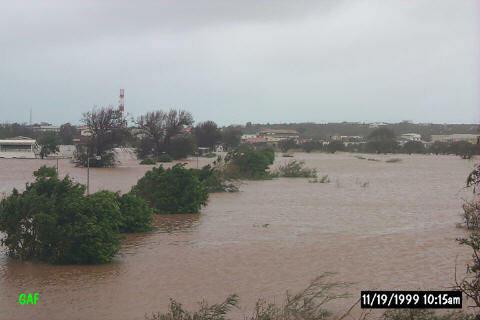 So far we have had two hours of heavy rain with thunderstorms and moderate winds from the southeast.However the beaches on the south west side of the Island are already suffering and a surf has started to push onto the north western beaches I would say the water level has risen two feet and still rising. We will try to report in at around 6pm, for now we are still boarding up our sliding glass doors. For all of you guys wondering about Anguilla. The sky is overcast and the wind is from the southeast with occasional showers the time is 2100 Z or 5pm local Tuesday Nov 16th, we dont know what to expect but we hope for the best, as usual. We do know that if we are the target we can expect trouble on Wednesday night. Good luck to all the other Islands in the track of Lenny.